On Tuesday, Craig Stephen Hicks, 46, has been charged with first-degree murder in the deaths of Deah Shaddy Barakat, 23, his wife, Yusor Mohammed, 21, and her sister, Razan Mohammed Abu-Salha, 19. There are some important things to note about this murder in particular, a. it barely got any media coverage, and b. it was a hate-crime, it was unecessary and cruel and shows just how far we've come as a country. To emphasize, there was a blatant hate-crime committed against Muslim-Americans and when the media did report the story they tried to cover it up as a "parking dispute." This country, the land of the free, is so corrupt and intolerant it's disgusting. On the flip side, the media is so quick to report on the newest fashion trend, the newest couple, however, the media is even quicker to criminalize black corpses. But let's not get off topic, let's look at the history to try to conceptualize this event . In the most comprehensive and systematic study of Hollywood movies done to-date, media scholar Jack Shaheen examined 100 years of Hollywood film representations of Arabs and Muslims. He found that the majority of the 900 films he examined portrayed Arabs and Muslims as "brutal, heartless, uncivilised religous fanatics and money-mad cultural 'others' bent on terrorising civilised westerners, especially Christians and Jews. Furthermore, the portrayal of Arabs and Muslims in the media is generally "stereotypical and negative," the study shows that TV news and documentaries have the stronglest influence of people's views of Islam, followed by newspaper coverage. Then we have what happened in Paris, adding to the anti-Muslim/Arab sentiment. Then of course 9/11, which hits close to home for me because I'm from New York, and even I fed into this stereotype and hated them, hated them all for the pain they brought to my city, hated them for bringing hate into my heart. Taking all this into account, it's easy to see why these hate crimes occur. Pause. Three innocent Muslims died yesterday. Three innocent Muslims died yesterday. Three innocent Muslims died yesterday. Let that sink in for moment. They died for their race. They died because of the stereotypes the media perpetuates, they died because of events that had nothing to do with them, they died because of America's inability to love all, to provide equality for all. America continues to fail people of color. I really don't know why this bothers me so much, honestly I shouldn't even be surprised anymore. This past week, a speech by David Talbot has been circulated by many of my Stanford friends on Facebook. The gist: gentrification in SF is caused by "Stanford assholes," the engineers and entrepreneurs who have moved in with their Teslas and Ubers and caused lower-income families to be evicted. The range of captions that accompany the speech on Facebook spans from "Amen." to "Hmmm I have mixed feelings but this Talbot has some good points" to "Hater." The camp that grades Talbot as a "hater" complains about his exaggerated rhetoric. For example, he calls for a liberation of the human spirit that trumps meaningless apps. Talbot's rhetoric is slightly sensationalist, but then again in the age of techno-capitalism, in order to be heard, it is often necessary to be over the top just so one's voice can drown out the noises of Oracle's bloc party downtown. And why is calling for the liberation of the human spirit considered cliched or unrealistic? Are we simply going to kneel before the new tech gods and believe in the propaganda that WiFi and smartphone apps will save the world? Have we become that enslaved to the aura of "tech"? Talbot does admit he's no neo-Luddite as he acknowledges the role of technology when it is used, for example, to allow Salon.com to go head-to-head with East Coast media corporations. But technology's wonders do not justify its frightening spillover for society. Every day brings new evictions – the carpenters, shoe repairmen, truck drivers, bookstore owners, grocers, nurses, teachers, firefighters, social workers, chefs and waiters, writers, artists. All the people who make up a living, breathing, multidimensional city – all gone or going. Replaced by the new class — those lucky code-crunchers and marketers who just exercised their stock options and can afford to pay cash and pay above the asking price for a home once lived in by a school librarian and her taxi-driving, poetry-writing husband who was just Ubered out of his job. Some people in the Stanford-assholes category probably have rolled their eyes at the mention of a "school librarian and her taxi-driving, poetry-writing husband." I mean, come on Talbot, why should I care about these poor people who cannot afford to pay rent? Right? Wrong. It is wrong that these financially capable newcomers can tour "artisanal chocolate tastings on Valencia Street, forking over enough cash to feed an entire family in the Mission for two or three days." It is wrong for teenagers to be kicked out of the soccer field because tech-adults can pay big cash to have them expurgated from public (?) spaces. It is wrong because, ethics. Money buys everything in San Francisco these days. It buys entire downtown city blocks, where armies of Oracle workers and other corporate empires are allowed to occupy the streets and throw parties to themselves. These 1% Occupiers are not beaten and teargassed by the police. They are coddled and protected by the city. [...] Last year, a young, Latino man named Alex Nieto was shot 14 times and killed by police near my house, on top of Bernal Hill, a scenic area where people like to stroll and walk their dogs. Someone had reported that Nieto, a 28-year-old security guard who grew up in the neighborhood, didn’t look right. How many more people are going to be shot or strangled to death until we (the people at Stanford, the people evicted out of Palo Alto or SF, the capitalists, the humanists) can do something about this 1%-99% problem? I have one more year at Stanford before I graduate and fully participate in this inequitable system. My time here has not taught me what I can effectively do to stop the brutality. The university's series of general requirements that are supposed to make us useful citizens aren't cutting it. Is it the failure of American higher ed to produce smart and capable grads who have no idea how to make world a better, more liveable place for everyone? Grads who don't even have the dream or the will to do the moral thing? I don't think we're all monsters, or in the words of Talbot's sons, "Stanford dicks" or "douchebags" or "assholes." Or maybe we all are, considering that so few of us are actively pursuing any common good. As I race to submit my resume to another corporate internship, I increase my level of Stanford-assholity. As you write another empty paper, get an A and submit your transcript to graduate programs that give you leverage to later get a nicely-paid job in SF's financial district, you score additional points on the Stanford-assholo-meter. Sometimes, when some of us muster the courage and rage to protest, we receive complaints, doubts and recently, a lawsuit threat. What are we going to do? Which bus do we jump on - the Google one or our own risky, dissident bus called activism that disrupts the capital flow? What about another marginal group of us called humanists with our libraries and lofty hopes to liberate the human spirit? Where do we go? Where are we heading as a society? The criminal justice system is the set of agencies and processes established by governments to control crime and impose penalties on those who violate laws. For me, justice means that people who commit crimes should pay for it. Of course it's not that black and white; crimes should be considered on a case-by-case basis but I don't think race should ever be a factor in determining sentencing. However, in this day and age, that is exactly what happens; people of color are the largest growing population in prison. 2014 has seen the greatest injustice it has seen in years. Homicides at the hands of police are increasing at a dangerously scary rate. As of late, in most of these cases these police officers often go unpunished. This is not what justice looks like. To highlight the racial disparities and clear disregard for the criminal justice system I want to look at two cases in Florida: George Zimmerman and Marissa Alexander. The one thing that both of these cases have in common is that both defendants used Florida's "Stand Your Ground" law to justify firing their weapon. The "stand your ground" law states that a person may use deadly force in self-defense without the duty to retreat when faced with a reasonable perceived threat. In other words, a person has no duty to leave a place they are legally entitled to inhabit and are allowed tocommit murder if they face an immediate threat. This law is extremely controversial because it is basically allowing citizens to take justice into their own hands. However, the real injustice is how this law was implemented in these two cases. Any situation where there is a weapon involved is cause to feel threatened, however, that doesn’t necessarily justify their death. George Zimmerman felt the opposite. Trayvon Martin was simply walking home in a predominantly white neighborhood, he was unarmed and 17 years old. He was not a threat. Ultimately this leads us to conclude that he was solely deemed a threat because of the color of his skin, something that he can't help, and something that definitely did not justify his death. Regardless, George Zimmerman is free and out in the world still getting into trouble. Marissa Alexander, a black woman, on the other hand, was the victim in this situation. She fired a warning shot at her very abusive husband, didn't kill him and use "stand your ground" to justify her actions. Precedent i.e., looking at the Zimmerman case, she should've walked away a free woman, she didn't even murder anyone. However, there is no such thing as justice for people of color. Instead she faced three years in jail before being given house arrest. This is not what justice looks like. Our justice system that we hold in such high esteem, the one that we try to implement and enforce in nations abroad, fails its own citizens, it failed Trayvon, Marissa, and countless others that as citizens expect the law to do what it was created to do. 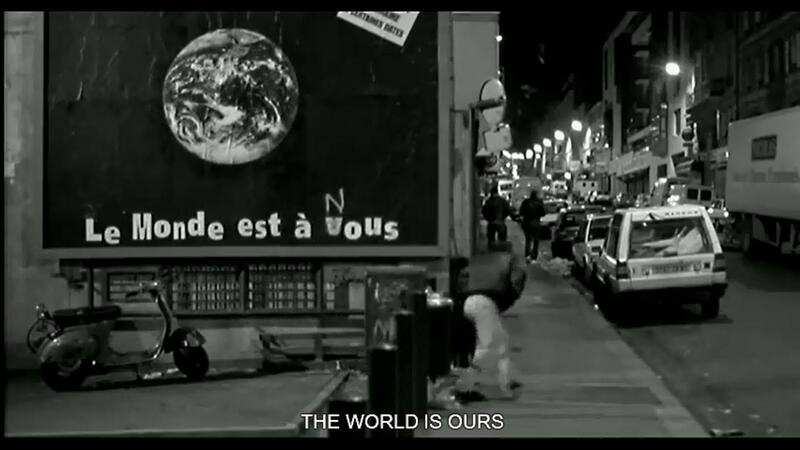 During our discussion of La Haine, someone mentioned that the concept of a "race issue" doesn't really exist in France, and this reminded me of a discussion I participated in this fall while I was abroad in Barcelona. About 10 people in our program got together after the Ferguson decision to have a round table, and we ended up talking about experiences with race, racism, and xenophobia in Barcelona and elsewhere in Europe. Our program advisers were surprised to learn that some people in the program had experienced racism everywhere from in classes to on the metro (for example, professors treating students of color differently, people staring and touching hair on trains, etc). Alarmed by our experiences, one of our advisers came to do another discussion with us, asking us to share our experiences in order to improve the program for future students. It ended up being a frustrating conversation, because our adviser insisted that there's no racism in Spain, only xenophobia. We were arguing the difference between individual prejudices based on race and the systemic racism we saw all around us (no professors of color, convenience stores run exclusively by South and East Asian families that everyone called "Pakis" or "Chinos"), but our adviser insisted that what we were seeing was xenophobia against Moroccan immigrants, East and South Asian immigrants, and even non-Catalan Spanish immigrants (something he experienced as a non-native Catalan speaker). This was a message we had already received from another professor in our introductory seminar, but we didn't feel it was accurate, and it was frustrating to have white Spaniards and Catalonians invalidate the injustices we saw around us by defaulting to terminology. Even if further research into the terminology did reveal that racism is dead and gone all the way from the Pyrenees to the Strait of Gibraltar, that still wouldn't negate the sting of "well, no students have ever mentioned this before!" I was disappointed to be out of the US for the beginnings of the #BlackLivesMatter movement, because it meant that I couldn't participate as actively as I wanted to. However, my abroad experience ended up being shaped by the movement, and it in turn shaped my perspective. It allowed me to appreciate and question the merits of being humble and accepting that life in Barcelona is different from life in the US, and the corresponding merits of challenging the norms in a foreign country that are more visible from the eyes of an outsider. The Convention of the Rights of the Child defines a child and seeks to protect the child from danger due to the vulnerabilities that arise from their innocence and youth. It desires to respect the wishes of the child and treats the child as an individual worthy of demonstrating autonomy in their lives. It reinforces the need to protect the child from danger in regards to drugs and all forms of psychological, physical or sexual abuse.